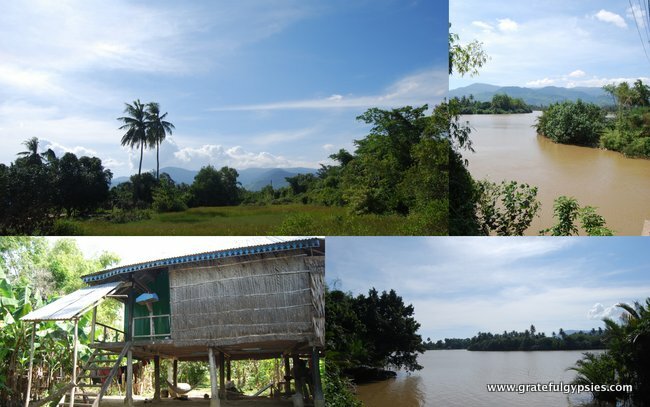 Getting to Kampot from Kep is not difficult nor is it far. Being only 25 km (15.5 miles) away, the bus ride only took about half an hour. Eager to continue our relaxed way of life that we established in Kep, we headed to our guest house. 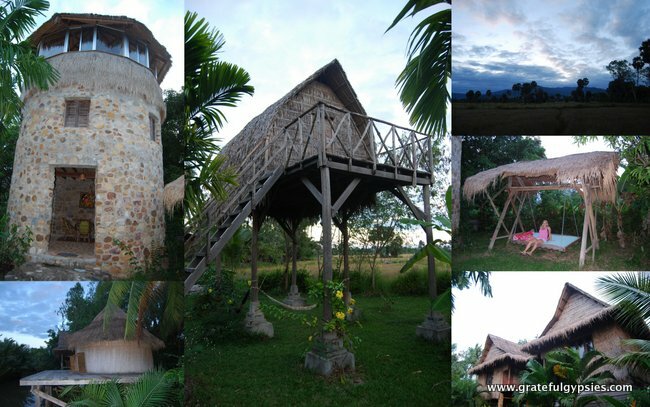 This is a quaint little guesthouse out in the countryside around Kampot. It’s managed by a very helpful and friendly staff. They also have incredible chefs. 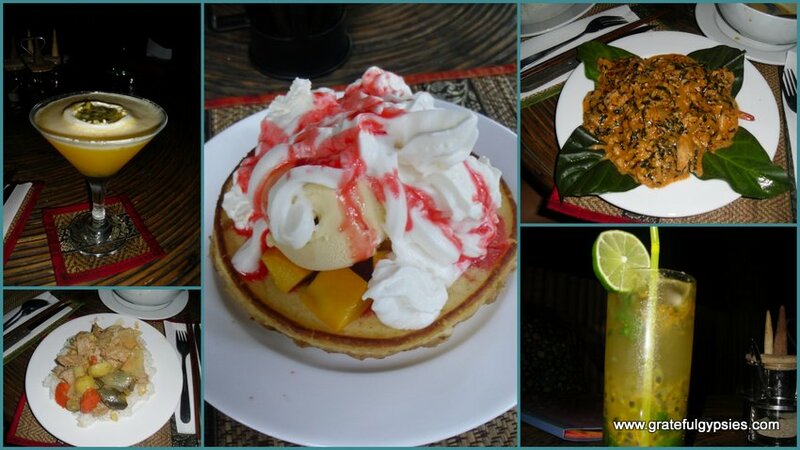 Some of the most delicious food we had in Cambodia came from their kitchen. We were also able to enjoy some creative cocktails with ingredients fresh from their garden. Passion Fruit was in abundance while we were there so many of the drinks were infused with the tropical fruit. Their pancake menu was perhaps the best I’ve ever seen. They had all the toppings that any kid (or adult) could ever want – everything from fruit to ice cream. Delicious food and tasty cocktails from Ganesha. The awesome food and beverages were not the only good thing about this guest house. They also have different room options. Guests can choose from a Mongolian style Yurt, a traditional Khmer style home on stilts, a standard room in the house, or a tower with a 360-degree view of the surrounding countryside. Unfortunately we were on a tight budget so we stayed in a standard room in the house, but we still thoroughly enjoyed it. There’s a lovely gazebo on the river where guests can relax in a hammock and read a book or there’s a pool table if you need something to do. Very novel sleeping options and amazing scenery. They also offer different types of tours. Probably the most popular is the countryside tour where you can see and learn about the salt fields and pepper farms, for which Kampot is famous. 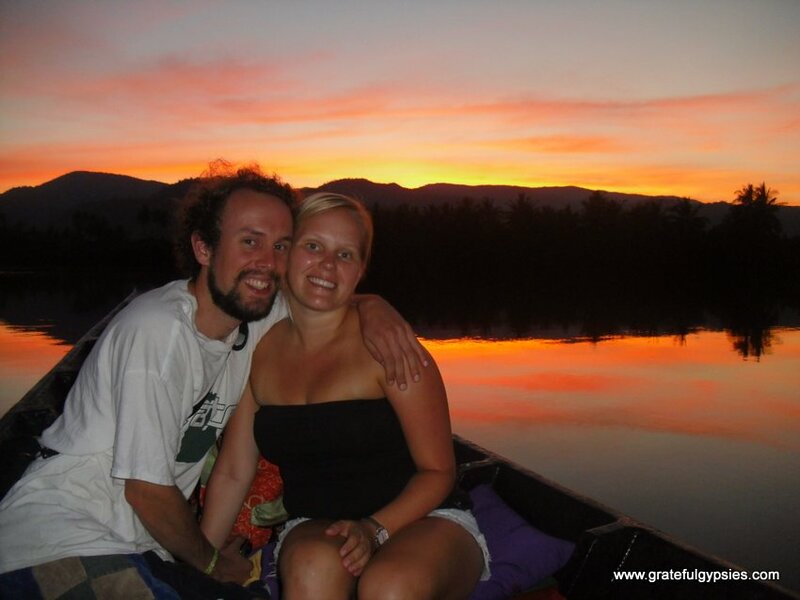 We chose the sunset river cruise and we got lucky with a stunning sunset. Just beautiful. I love sunsets. 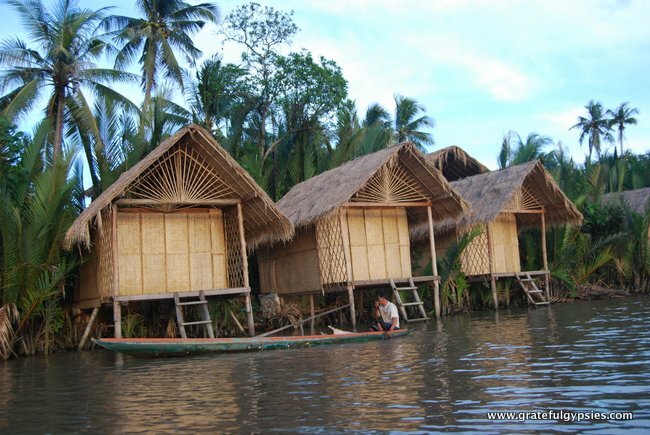 Little bungalows on the river. 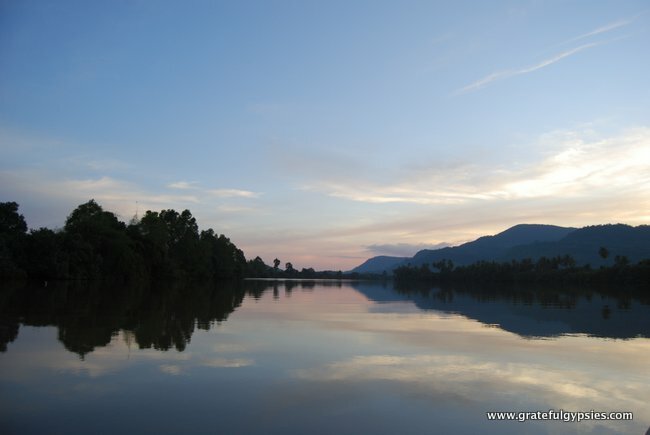 Kampot is a charming little town with plenty on offer. Visitors can spend their days admiring the colonial architecture and then enjoying happy hours at one of the many restaurants or bars. Our first night in town, we went to a place called Ecran which is the local “movie theater.” They have an extensive catalog of movies for you to choose from with several private rooms that hold about 5 – 8 people and they also have a large viewing room with a huge projector screen with regularly scheduled viewings. If you’re hungry they have a small kitchen that serves Chinese dumplings and noodles. We were really excited about this since we hadn’t had our favorite Chinese food in a while. The night we went they were showing “The Killing Fields” which is a movie about the terrible days of the Khmer Rouge in Cambodia. These events are important to understand as they have a huge impact on what the country is today and how it has recovered. It is a must-see, especially if you are going to visit Cambodia. If you have a need for Mini Golf, then head over to the Magic Sponge. They have a 9-hole course you can play while enjoying a beverage or waiting for your meal and it’s free. The menu is quite large with many options ranging from local dishes, to Indian cuisine, to Western comfort food like baked potatoes! The full-bar is also nice. It’s also a hostel with both dorms and private rooms. We went there for an early dinner and then headed over to the river front for happy hour. Rikitikitavi has a great cocktail menu and nice terrace that overlooks the water. If they’re full (which is likely), the Rusty Nail is not far away and also has a decent happy hour. If you have room for more after the food and beverage, stop by one of the many fruit shake stalls for a tasty snack. Winning a round of mini golf and enjoying the food and bev. 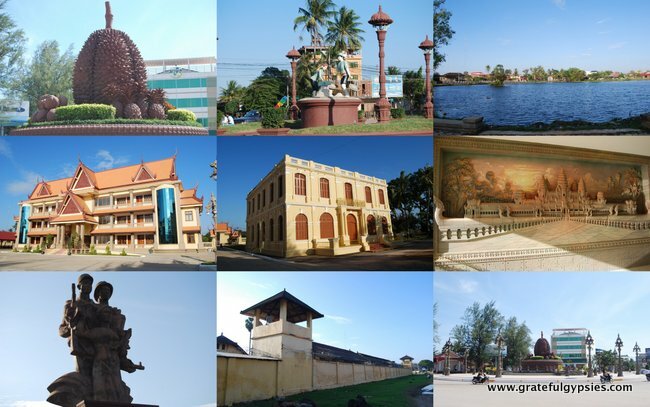 From top left: the big Durian statue, the Salt Workers’ Monument, along the river, the Governor’s house, the house for employees of the Governor’s estate, a cool carving of Angkor Wat in the Governor’s house, the Cambodia-Vietnam friendship statue, the prison (which is still active) and the main roundabout in the town. 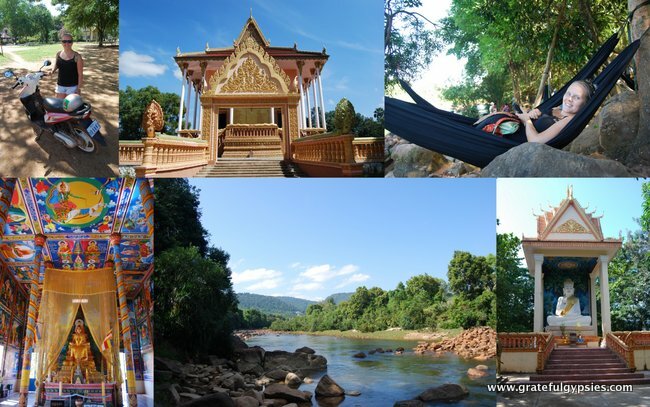 These are a few of the sights you can enjoy while in Kampot. 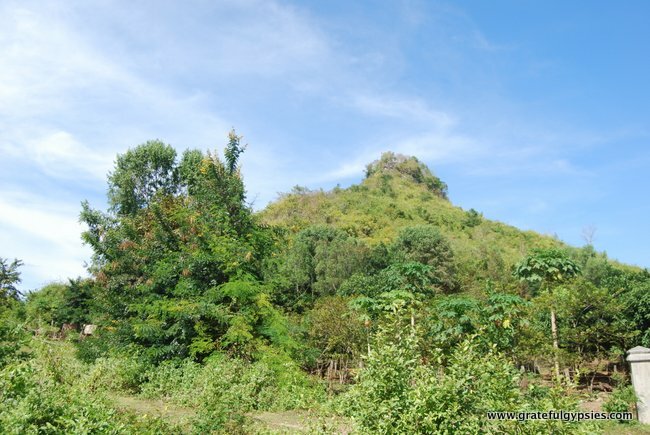 There is beautiful countryside all around Kampot. One day we decided to take the free bicycles from our guest house and ride to Phnom Sor, which means White Mountain. It took us about one hour to cycle there and another 30 minutes to climb to the top. It was very hot and there wasn’t much shade, but the view from the top was amazing! There is a fortune teller who lives at the top who will read your palm; she doesn’t speak English so you would have to know some Khmer or bring a translator along. We decided to rent a motorbike for a day of our stay in Kampot since there are so many things to do outside the main town. We really wanted to find the caves in the countryside since we had heard so many good things. We were given what seemed like easy directions from our guest house and a map, but they were quite difficult to find. Instead we found a nice temple and a big group of kids who were fascinated by us and followed us around while we explored the temple grounds. They were even more excited when Sasha shook their hands since that is exotic for them. Once we finally decided to give up on finding the caves we headed to the other side of the town. We spotted an area on the side of the road with a small temple and hammocks overlooking the river, so we stopped and relaxed for a while. It turns out this area is called Teuk Chhouu and is included on the Wiki Travel page as a place to visit while in Kampot. I prefer finding these things on accident on my own rather than seeking it out. If you’re short on time the places can be combined into one. One place can easily be visited in a day trip from the other. 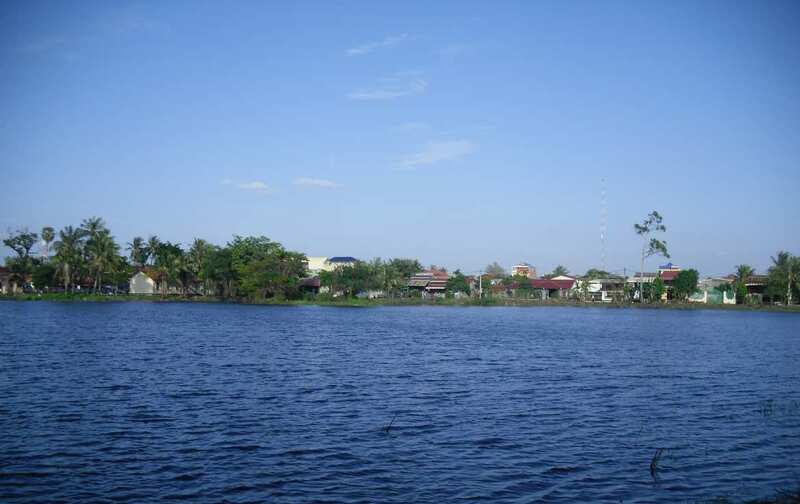 Our visit there was very relaxing and Kampot was a great place to get ready for the rage-fest of Sihanoukville. Check back soon for our post about that. Cruising on the river in Kampot. Transportation: We arrived in Kampot via a 30-minute bus ride from Kep. It’s a logical next stop after Kep if coming from Vietnam, but if you’re going in the other direction, you’d most likely arrive from either Sihanoukville or Phnom Penh. 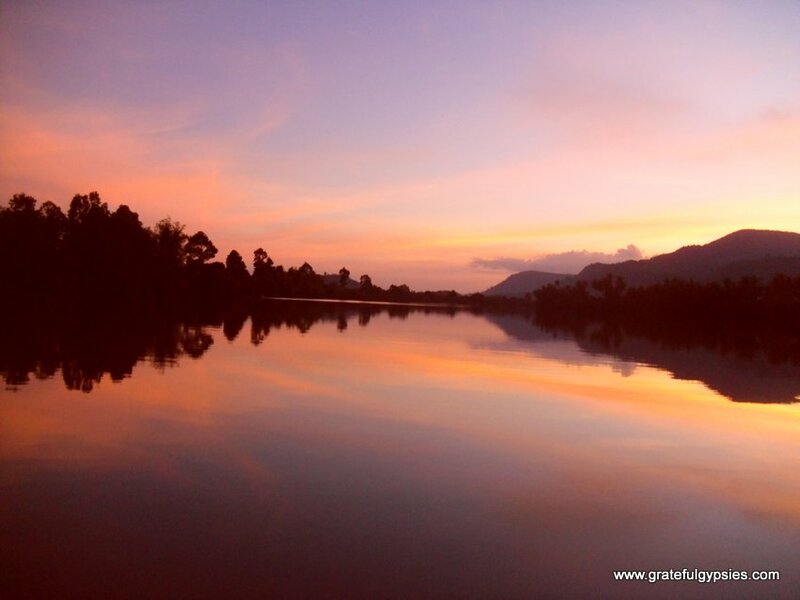 Accommodation: During our stay in Kampot, we called the Ganesha Riverside Eco Resort home. Although it’s a bit far from the center of town, which involves a bumpy ride in a tuk-tuk or on the back of a motorbike, it is well worth the effort. Situated out in the countryside on the river, this place is much more relaxing than staying in the town. 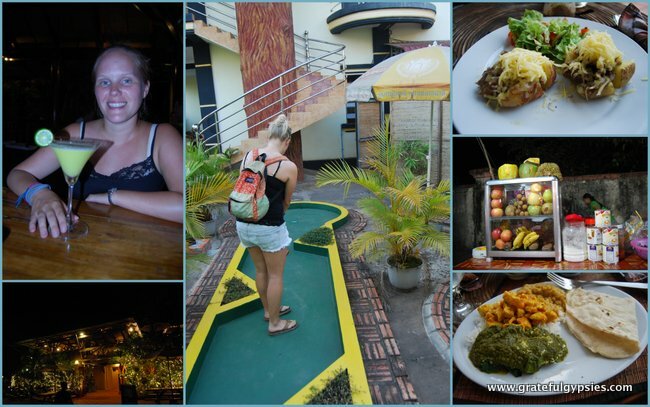 They do tours, provide free bicycles, can get you a motorbike, and they make some of the best food and cocktails ever. Plus, the owners are super cool and they like to hang out at night, listen to chill music, and share stories. One of the best places we’ve stayed in our long SE Asia trip for sure. Our private room in the house was $12/night. Check their website for rates, as they fluctuate with the season and depending on which room you choose. Getting Around: While the town itself is walkable, it’s better to have some wheels for your stay here. During our three days, we borrowed bicycles, rented our own motorbike, and hopped on the back of motor-taxis and in tuk-tuks to get around. Activities: Walk around the town and enjoy the riverfront plus the interesting architecture and statues. Cruise around the countryside on a bike. Hike up a small mountain and then lounge in a hammock by the river. Get dinner, play mini golf, enjoy tasty cocktails, and catch a flick in town. Tour the salt fields and pepper farms if you’re interested. Food/Drink: The food was so good out at Ganesha that we ate a lot of our meals there. We also enjoyed Chinese noodle and dumplings at Ecran, and the Indian & Western fare at the Magic Sponge. There are tons of cool bars to have an adult beverage, and you can also sip on sugary fruit drinks in the street. Recommended Time: Three days was pretty good, but we definitely could have stayed a few more to relax out at Ganesha or explore the surrounding areas a bit more. As we mentioned in the Kep post, a good rule of thumb would be to budget one week between the two places. Total Cost: We spent just over $200 for our three days in Kampot, including our bus tickets there. A good $20-30 of this was spent getting to and from our guesthouse, but we’d say it was worth the extra money and time to stay there instead of in the town.